The last of our Canadian passage is complete. We’re no longer under the Canadian flag, and we’re not under the American flag, yet. We ‘re motoring in between countries, passing the San Juan deFuca strait. The sun is trying to peek out from under the heavy burden of overcast, down in the dumps grey. 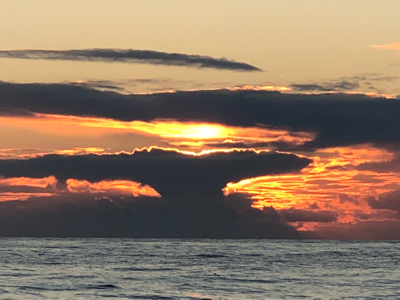 The graceful whales are gone; the comical sea otters, beautiful crystal blue water, white sandy beaches, sea turtles, benign sharks, towering palm trees springing up in the horizon, Japanese trains, and the Effin logs- especially the one we hit last night! We are overwhelmed with various emotions. We swing from elation to tears. How do we start a new life style. So much of ourselves have changed. Displaced, estranged from landlubber life. Cars, utility bills, Wednesday’s garbage can night, traffic, clogged grocery stores. Makes us want to sail west. Thrilled to see our families for sure! Reacquainting with old friends, maybe find a job so we can enjoy the American dream of “home”, and even rebuild the cruising kitty after paying off the enormous dent in our sons’ inheritance. Whatever life style we choose tomorrow, John and I are lovingly grateful for one another’s tenacity. We couldn’t have gone so far and long without our family support for the last 3+ years, we owe them a debt of gratitude. Can we borrow a car, couch, shower? And lastly, we are honored for the experiences shared with different cultures and the people. We have been humbled by this very fragile, beautiful planet. 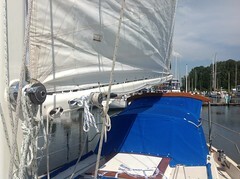 We sailed a good run from Millbrook cove anchorage Saturday morning. 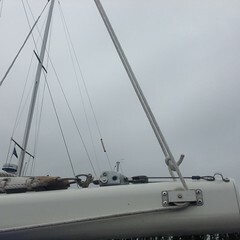 Rounded Cape Scott with 1 kt favorable current and 12 kts of wind. It was fun sailing while it lasted. About 50 miles from Cape Scott is Brooks Pennisula. A rectangular shaped peninsula spanning westward nearly 10 miles. As with any other cape protruding out with shallow water and extensive shallow shoals the waves pile up when it’s blowing over 15kts from north or south. Our wind died long before we arrived at Brooks leaving us with a very large swell and 2 meter waves stacked on a short period. We rolled hard from side to side. All sailing strategies couldn’t help us. Giving up, we had to start Konami’s boyfriend, Perkie. Well as plans change all the time, we didn’t have enough fuel when we left out, thinking we’d be stopping in a port before running the inside passage of Vancouver Island. Mistake. 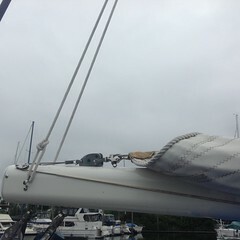 We calculated our fuel burn and had Esperanza made, a total of 145 miles from the anchorage but no more. Early morning, our first overnight passage since departing Kodiak a beautiful sunrise over Eliza iInlet bound for Esperanza. The tiny marina/resort turned out to be a very quaint stopover. They cater to a Christian camp for children. A nice easy enter fuel dock with good service, free delicious coffee and ice cream bars with a fuel fill up. They were an awesome group of people! 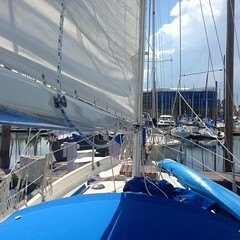 Tanked up, we headed right back out into rolling seas and wind less than 15kts. In this heading and wind behind us it’s a rough combination. The waves are so big we slide sideways down the breakers. Either blow or be done with trying! 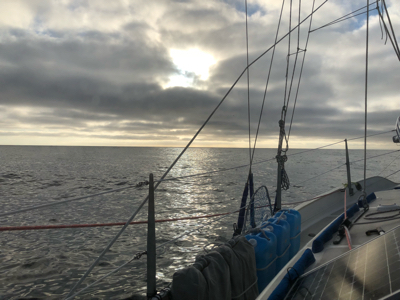 We’ve been motoring all day, probably through the night as well as winds are forecasted to be less than 10 kts, but the waves continue as we whine. We just want to go home now. How much longer will it be? Before departing Hoonah we received a spiritual and warm Klingit blessing “farewell for a safe passage”. 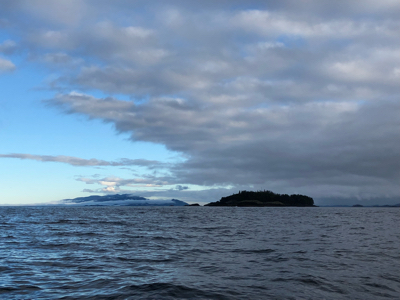 We headed east into windy Icy Strait bound for Auke Bay north of Juneau. Directly behind a group of Islands on our course, a pod of humpback whales were bubble feeding. Seven whales were circling and blowing, stirring up the herring. As they tightened their circle around the herring the seagulls flew and swooped overhead waiting for the fish to surface. The birds watched as the whales finishing circling, they quickly scattered as the whales shot straight up out of the water gulping massive amounts of herring, churning and splashing sending out large waves. Three, five, and then the seventh dove with tremendous force and grace. Unable to look away we drifted for a long time, fascinated by nature. 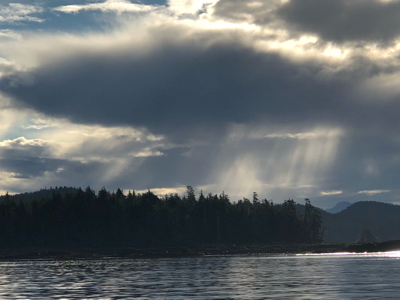 We made a total of nine other stops after a Hoonah, taking us 12 days. We were held up in protected Taku harbor for three days on a nice free public dock. The wind howled through Stephens passage,the most eastern main water way. We watched the impressive effects of opposing high wind and speeding current smashing in the entrance shores. Our last encounter of icebergs was in Glacier Bay but we wanted to see another glacier and that was what led us so far inland. Tracy Arm inlet off Stephens passage is suppose to be wondrous. By the time we arrived the weather had warmed just enough that the glacier must’ve calved sending bus size icebergs into the entrance. Having been held up in Taku too long we didn’t stop by. 15 miles later in calm water with beautiful sun, we saw icebergs in the middle of our courseljne. We circled one berg taking video and pictures, nearly twice the length and width of Konami. That was spectacular! A few miles later we stopped the boat again to watch numerous humpback whales spouting and diving. We were so engrossed watching from port side we missed the whale approaching us closely on starboard. Just as the whale approached it spouted a loud burst startling us. Got a couple nice shots of the fluke as it dove. That was the last of our whale and berg sightings, the “Narrows” were still ahead. We passed through two “Narrows” of which the chart books indicated “you will feel like accomplished sailors when you are done”. Maybe we’re accomplished sailors though it wasn’t a significant event. Continuous 8-10 hour motoring days, we enjoyed the majestic glacier carved mountains, brutally rugged snow capped peaks over 12,000′ towering over the collapsed volcanoes covered with old growth forest. All the beauty of Alaska can’t be captured by a camera. Our last stop was in a remote area, close enough so that we wouldn’t have to cross Dixon entrance at night. 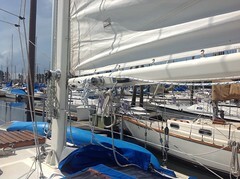 More accomplished sailors will make a 90 mile crossing overnight. Huge logs, some with root balls still attached, shaped like giant arrows target vulnerable sailboats. 10′ x 12′ Kelp patches with plastic, twigs and other perilous items float silently, waiting to rip off a wimpy propellor. We’re not accomplished sailors up for a challenging passage posed before us. Our last stop was Nakat harbor, 45 miles to Prince Rupert. No mountains, bears, or bergs, just nice tree lined calm waterways off the main channel. It was very serene, just what we needed to reflect on our passage through Magnificent Alaska. We arrived too late to catch the last tide into Cape Spencer, the entrance to the mire protected water. We were treated to a clear dark sky lit up with glowing green ribbons of bright northern lights across the Fairweather mountain range. It was truly mystic and fascinating. We spent two nights in quaint Elfin Cove, an old WWII lookout base now a stop over for the Alaskan fishing fleet and cruising boats. The weather continued to provide warm sunny days for exploring Granite Island and the near extinct Steller sea lion. 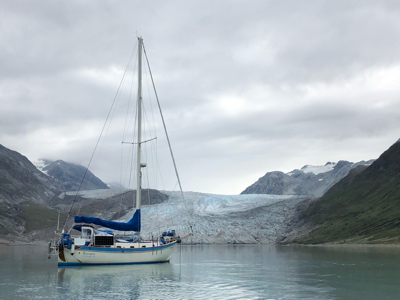 We moved across to Glacier Bay for five days. The highlight was the stunning, scary and formidable glaciers. 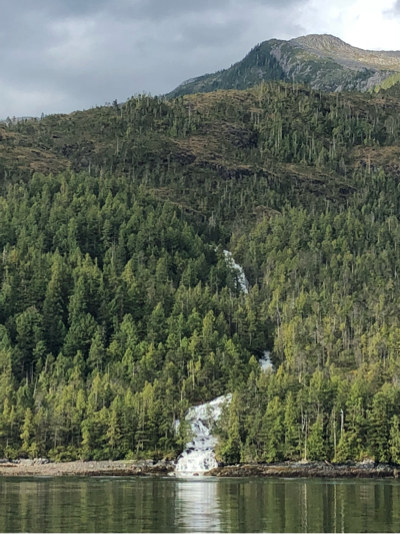 We motored to Johns Hopkins Inlet, nearly half way to the glacier face until the icebergs choked the passage. We sat and watched in awe as the glacier cracked with loud booms and groans hoping to watch it calve. (Enormous chunks of ice fall from the face of the glacier). Instead we witnessed a rock slide from a bare vertical cliff just 300 yards ahead of our bow. It slid nearly 200 feet into the water sending up a huge dust cloud that lingered for 10 minutes or more. That was deafening and startling! We anchored in icy cold Reid Inlet. The water was a milky turquoise green from the glacier runoff at the head of the bay. We hiked up to the face to listen and watch a fast running river coming out from under the massive glacier. It was a very heartfelt hike, feeling humbled standing before 100′ of ancient ice. Another incredible moment of our cruising journey. We arrived in Hoonah, a very close knit Tlinglit, pronounced “Klinkit” Indian village at the top of Chichagof Island. The natives are kind and eager to share their family ancestry, artwork and wood carving. Some of it was commercialized for the cruise ships that sustain the economy but we met several natives who were genuinely interested in explaining their history and meaningful art. We had a very relaxing two days in the easy dock. The Fall season is approaching rapidly now, the days are significantly shorter and we’re starting to feel pressed for time to make it home. We’re continuing eastward, deeper into the inside passage. Send us light winds, sun and calm waters in your thoughts. Here he is all happy to be cleaning our home, just before he ruined part of our bedding. No picture of messed up John after I scolded him for hanging the blankets out over the lifelines. We are almost giddy to be close to arriving at the entrance of Cross Sound. Our high pressure cushion held up and appears we may not be caught out with big waves and winds on our nose from the 35 knot low system now slamming Kodiak. Diesel bill for this easy passage?, priceless! Off in the distance, about 70 crow miles away, we are treated to a spectacular view of the snow capped mountain range enclosing Glacier Bay National Park and Preserve. I believe it’s rare to have clear enough weather to view the full range and actually see the stark white glaciers between the tall peaks. Magnificent! Sorry the pictures can’t do it just from here. But in addition to the view from the ocean, I was able to call from our Sat phone and get a short term notice permit to enter and spend 7 days touring the park. How wonderful is that? We’re hoping for clear weather within the park. The winds are forecasted to be very light, Woohoo! but the downside is the “F” word – Fog, Faugust is what the Alaskans call this month. Our last night out before landfall, send us bright sunny wishes! To my parents: Happy 65th Anniversary, I wouldn’t be here without you, all my love! We are half way across “The Gulf” making very good seaway. There is a 35+ knot blow coming from the south so we are motor sailing trying to maintain decent speed. Dejavu Japan crossing. We changed our destination to Cross Sound- the entrance to the Inside Passage. An additional 100 miles making a total distance of 500 miles – four nights, as a spiraling low appears to stall and the high pressure along the northwest coast of Alaska is forecasted to hold allowing us to squeak in. 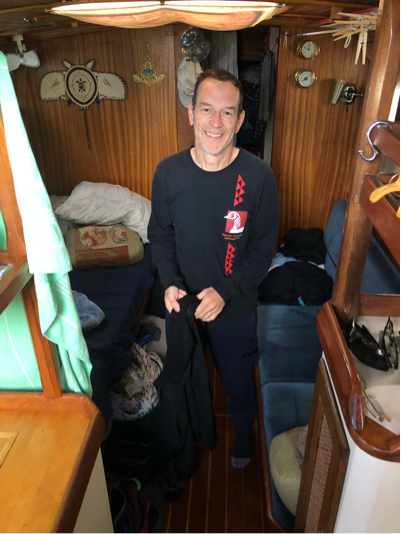 By pushing ahead we will make up more than three days of sitting in a marina waiting for another departure window to continue south. We have an alternative safe harbor should the forecast drastically change. 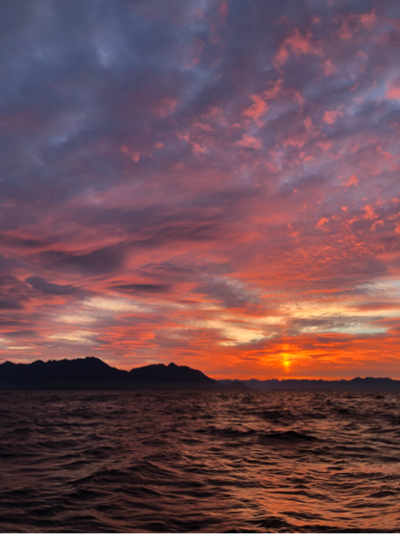 The weather is either good motoring or just bad winds and seas in Alaska, so the fishermen say. 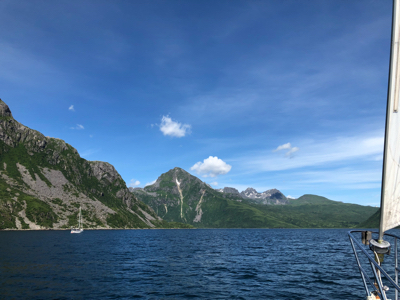 The seas have been rolly at times with big currents from the farthest north Cook Inlet, Prince William Sound, and other large inlets of water either help or oppose our speed by as much as 1.5 knots. The ocean depth in some places exceed 15,000 feet and the water temperature has warmed to 56 degrees at the surface being exposed to southern water. Beyond enjoying warm sunny days, we watched a small ray of “northern lights” dance and big blobs of blue-purple bioluminescence trail behind the boat as the engine exhaust system spat water. The moonless night air was so clear the stars reflected off the glassy sea. These kinds of moments help the bitter-sweet emotions John and I are presently experiencing – Sailing into the unknown. We’re so humbled and grateful that our childhood dreams were fulfilled. 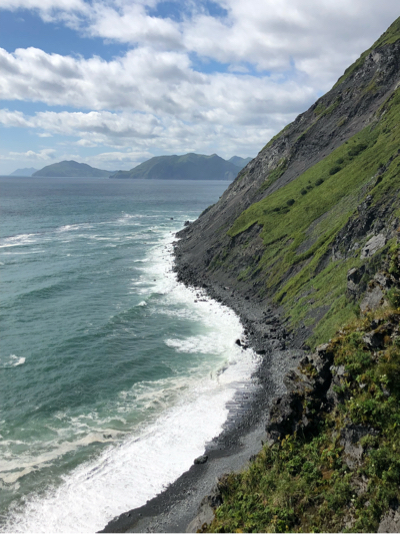 Kodiak is more than we anticipated. Wonderful fishing community, generous people offered us rides to the store, laundry, hiking, driving all around the island and lots of fresh fish. We’ve enjoyed the long daylight hours, warm summer days, fantastic juicy wild berries, mushrooms and bear watching.